The Chhattisgarh Farm Loan Waiver Scheme has been introduced by newly formed Chhattisgarh government. The details of the scheme have been detailed by newly elected CM Bhupesh Baghel. The main aim of the scheme is to extend help to the needed farmers. Chhattisgarh government will renounce crop loan of 16.65 farmers that sums up to around 6,100 crores in the agricultural sector. It mainly aims to waive off the bank loans that farmers have opted for from cooperative and CG Gramin banks. Farmers who have taken a loan from commercial banks will be renounced only after analyzing the amount properly. The related announcement has been made in a press conference. Poor and marginal farmers – The enrollment of the farmers belong to the small-scale sector will be allowed in this scheme. Also, the CG and marginal farmers are also included to avail the benefits under the scheme. Loan taken from Gramin and commercial banks – The farmers who have taken the loan from CG Gramin banks, cooperative banks and commercial bank will be waived off completely within 10 days of implementation of this Yojana. 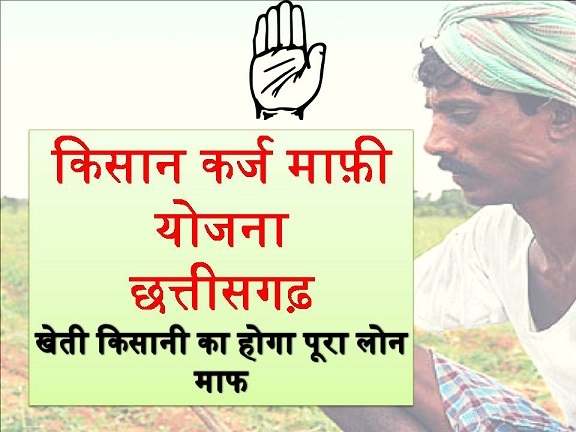 Residents of Chhattisgarh – To avail benefits of the scheme, the farmers should belong only to the state and only the legal and permanent residents of the state will be allowed. Date of credit application – The applicants or farmers who have taken loan before 30th November 2018 will be waived off by the government and can avail benefits under the scheme. Limit of loan – Under the scheme loan will be waived off for around 6100 crores rupees. It will ultimately help almost 16.65 lakh farmers in the state. What are the documents required to apply under Chhattisgarh Farm Loan Waiver Scheme? Residential details- Since the Yojana will be implemented in Chhattisgarh it is required for the farmers to submit their residential details in order to avail benefits under the scheme. This is required to ensure that the farmers belong only to the concerned state. Details of bank account – According to the loan, it is necessary to provide the details of the bank account that will have the details of all loans taken by the farmers. It will help the state government to waive off the total amount after proper analysis of the same. Aadhaar card – For identification claims, this is mandatory to provide as one of the necessary documents required for the scheme. Farmer registration papers –The main aim of the scheme is to waive off loan amount for the marginal and poor farmers and therefore, it is necessary that the farmers have to provide documents that ensure that the person belongs to the agricultural sector. In addition, the document will help to understand it is their primary occupation. No specific method for getting the application form and procedure to fill up the same has yet come out. As soon as the enrollment process comes, the farmers will be able to get the required information from the portal of the Yojana. The state government will notify with the latest update pertaining to the scheme. During the first cabinet meeting, the government of the state has planned to provide MSP or Minimum Support Price of paddy for rupees 2,500 per quintal which was rupees 1,700 previously.